I didn’t feature gifts for men in my gift guides this year, so I wanted to put together a simple round-up of ideas incase you are in need of some inspiration. There’s everything from gadgets and electricals, to books and fashion accessories. 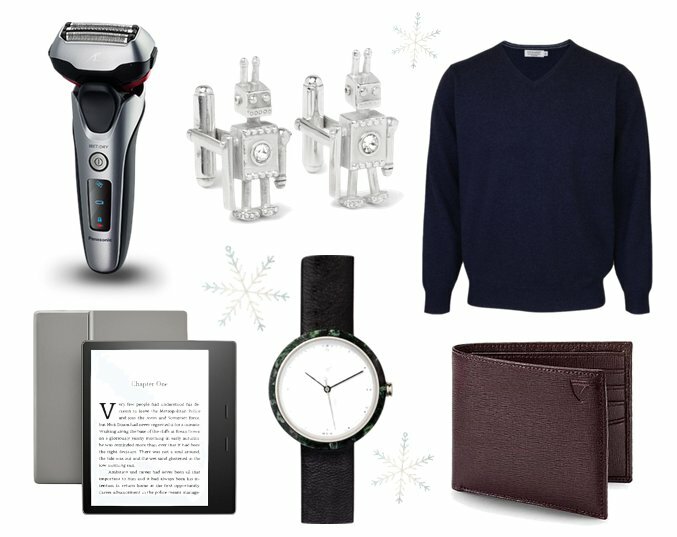 Panasonic 3-Blade Shaver, £199.99, Panasonic | Prada Robot Silver Cufflinks, £300, Mr Porter | Sennheiser Black CX 5.00 In-Ear Headphones, £70, Debenhams | Lochmere Pure Cashmere V-Neck Jumper, £95, Edinburgh Woollen Mill | Flint Watches Charcoal Aravalli Green Marble Men’s Watch, £180, Wolf & Badger | Aspinal of London Billfold Wallet in Saffiano and Espresso Suede, £80, Aspinal of London | Kindle Oasis E-Reader, £229.99, Amazon. 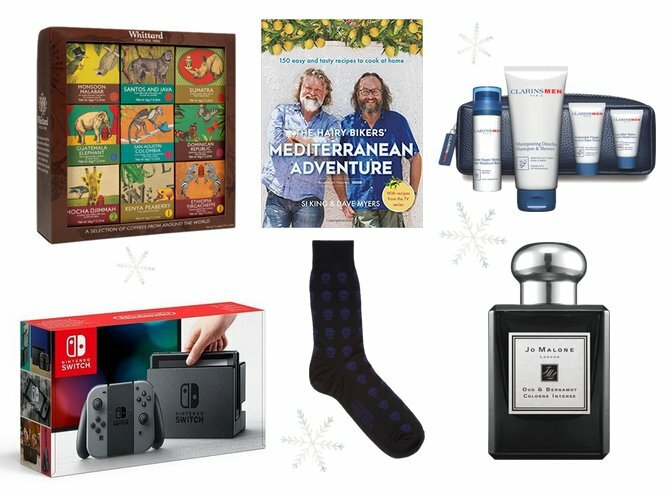 Whittard Coffees of the World Gift Set, £25, Whittard | The Hairy Bikers’ Mediterranean Adventure Cookbook, £7.99, Amazon | Clarins Men Hydration Collection, £40, House of Fraser | Nintendo Switch Console, £279.99, Tesco | Alexander McQueen Skull-Intarsia Cotton Blend Socks, £50, Harvey Nichols | Jo Malone London Oud & Bergamot Cologne, £75, Selfridges. Panasonic actually have some video reviews on YouTube for one of their trimmers (watch it here) – a great way to check out a gift in action before you buy. If you’re still looking for some more men’s gift ideas, Gear Hungry, GQ Magazine and InStyle have some great guides, so go check them out. Think about the hobbies the men in your life have; think about what they read, play and watch to relax; think about what would make their life easier; think about what they already have that needs replaced; think about what would just put a smile on their face. It doesn’t need to be expensive and it doesn’t need to be unique – it just needs to be something that will make them happy. I have full female gift guides on my blog too – for stocking fillers, Mums & Aunts and BFFs – and I have personally chosen and reviewed everything featured in them. I hope that they give you lots of inspiration when chosing your loved one’s presents this year (or even ideas on what to ask for yourself). This post is in collaboration with Panasonic, but all opinions are my own.